Do you ever feel that you are struggling under the weight of something that you can't quite put your finger on? Perhaps your life is not turning out how you wanted it to. You may wish that certain events in your past had never occurred. You may even have an uneasy feeling that your present is somehow being held hostage by your past in some vague and indefinable way. People often sense that they have emotional issues, but don't know how to get past them. The feelings that seem to be in their way are often due to their trapped emotions. They are usually amazed to find out that their emotional baggage often consists of discrete energies that became trapped during emotional events they experienced in their past. They are even more amazed to see how easily these energies can be found and removed and by how different they feel when they are freed from them. In the same way that you cannot see the wind, yet you can feel it's effects, trapped emotions are invisible and they can exert powerful forces upon you. Trapped emotions can affect you physically just as much as they can mentally and emotionally. It is my experience that a significant percentage of physical illnesses, emotional difficulties and self-sabotage are actually caused by these unseen energies. The Emotion Code has been created to give you new insight, to show you how trapped emotions can cause all kinds of problems, and give you the means to release them. You can take your life back, enjoy better health, and finally be free from the insidious and subtle forces that trapped emotions are exerting upon you. 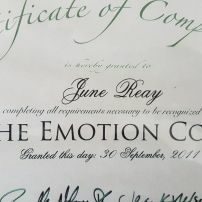 Releasing trapped emotions using The Emotion Code, or any other type of Energy Healing practiced by the provider on this site, whether in person or by proxy, is not a substitute for medical care. This information is not intended as medical advice and should not be used for medical diagnosis or treatment. Information given to you on this site or in any session obtained on this site is not intended to create any physician-patient relationship, nor should it be considered a replacement for consultation with a health care professional. If you have questions or concerns about your health, please contact your health care provider. Energy Healing promotes harmony and balance within, relieving stress and supporting the body's natural ability to heal. Energy healing is widely recognized as a valuable and effective complement to conventional medical care. Healing sessions are strictly confidential. Your personal information will never be shared with anyone. I make no claims as to healing or recovery from any illness. This information is offered as a service and is not meant to replace any medical treatment. No guarantee is made towards validity. Use this information at your own risk. commented on "Anne from Wagga Wagga ..."
commented on "Hi June, ..."
commented on "Hello my name is Jason I am 44 years old and live in England. Three years ago I had a shock diagnosis of cancer in my Kidney, ..."
commented on ""When I contacted June I had reached yet another low point in my life, I was extremely unhappy and struggling, and I was uncertain, ..."
commented on "June is a very wonderful lady who has a passion to help others find healing and freedom and to reach their highest potential, which ..."